ABOUT THIS INTERVIEW: On September 18th 1964, the Beatles found themselves in Dallas, Texas, the city where President Kennedy had been assassinated less than one year before. The Beatles performed one show at Memorial Auditorium in Dallas, giving this brief television interview before the concert. In responding to questions from a Dallas newsman, Paul and Ringo had the opportunity to practice their cowboy-like southern accents. 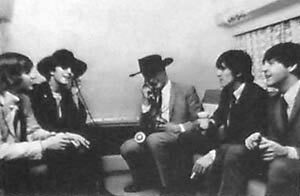 Each of the Beatles, including Manager Brian Epstein, were given cowboy hats, which the Beatles wore to comedic effect during this interview as well as clowning around in their dressing room. On September 19th, the group took a well-deserved day off in Missouri at the home of rancher Reed Pigman. 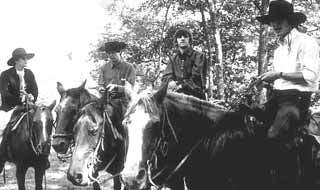 Here the Beatles rode horses, ate home cooking, and relaxed, enjoying the friendly hospitality and country atmosphere. Brian Epstein celebrated his 30th birthday with the Beatles at the Pigman ranch. The Beatles would return to New York City on September 20th for the special charity event that was the conclusion of the current North American tour. The event entitled 'An Evening With The Beatles' was in support of United Cerebral Palsy. The Beatles gave their performance for free, as did the other supporting artists. Q: "Although you havent seen much of Dallas, the part of it that you have seen, what do you like?" PAUL: (southern accent) "Well... pretty fine! Pretty fine." Q: "Did you get to see the Presidential site?" PAUL: "No, the only bit that we've seen so far is the hotel." JOHN: "And the drive looked like a nice place when we drove to this place here, whatever this is." Q: "Ringo, do you have any political affiliations at all?" Q: "What kind of cigarette is that? Is that roll-your-own?" PAUL: (southern accent) "Roll your own!" RINGO: "One of these, but it don't work too well..."
RINGO: "...he said, in an American accent." Q: (to John) "What kind of girls do you prefer?" Q: "Your wife? What kind of girl is she?" JOHN: "She's a NICE girl." Q: "Ringo, when you marry, what kind of girl are you gonna..."
RINGO: "Oh I dunno. I haven't sorted one out yet. I like 'em all." Q: (to George) "What kind of girl do you like?" JOHN: (smacks George on shoulder, jokingly) "Nobody likes a smart aleck." Q: "Do y'all have any books coming out now... any time soon?" PAUL: "John's the only one." RINGO: "John's the one with the book." JOHN: "I havent got one... I've got one coming out next year as soon as I've written it." Q: "What's the name of it?" JOHN: "I don't know. I haven't written it yet." Q: "Is it a mystery, or what kind of books do you like to write?" GEORGE: (jokingly) "I'm writing a detective thriller"
Q: "Last night you had a lot of difficulty getting into the Cabonia. Did any of you get hurt at all?" GEORGE: (jokingly) "I got punched in me face... a few times. But I mean, thats part of life, isn't it." PAUL: (southern accent) "We gotta move on. We're rollin' now." RINGO: (southern accent) "We're gonna move this stage on down to New Orleans." Q: "Are y'all going to New Orleans?" RINGO: "No, we were there the other night. Very hot there, you know." Q: "Thank you all very much."